The annual non-waiver trade deadline is 4pm ET on Wednesday, so pretty much one day away. The Yankees have already pulled off one pre-deadline deal by acquiring Alfonso Soriano and a bunch of cash from the Cubs for minor league righty Corey Black. They were desperate for a right-handed power bat and the trade has already paid dividends, as Soriano hit a two-run homer and a walk-off single on Sunday. That move was a good first step, but the Yankees need much more help than that. They need an everyday third baseman — seven different players have combined to hit .217/.276/.288 (55 OPS+) at the hot corner this year — especially since it looks increasingly unlikely Alex Rodriguez will return to the team at some point. A righty platoon bat for Lyle Overbay, a catcher, and maybe even a starting pitcher should be on the trade deadline shopping list as well. The Yankees haven’t made a notable trade at the deadline since way back in 2006, when they brought in Bobby Abreu. By notable trade, a mean a legitimate above-average player. Someone who didn’t require you to squint your eyes and say “maybe he has something left in the tank.” I don’t know if the team will buck that trend in the next 24 hours or so, but if they were ever going to do it, this would be the perfect time. We’re going to keep track of the day’s Yankees-related rumors right here in this post, so check back often. All times are ET, obviously. Talk about anything trade deadline related — rumors, crazy hypotheticals, etc. — here as well. 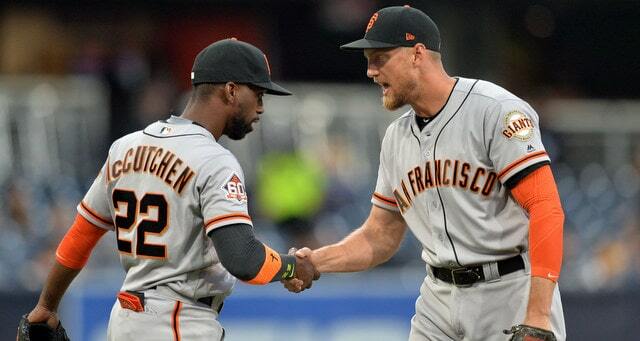 Via Joel Sherman: The Yankees have asked the Giants about the availability of Hunter Pence. It’s unclear if they’re still interested after acquiring Alfonso Soriano. Ken Rosenthal says San Francisco will indeed entertain offers for the free-agent-to-be outfielder. The reigning World Champs have lost 26 of their last 37 games (!) and are nine games out of a playoff spot. Pence, 30, is hitting .278/.321/.459 (119 wRC+) with 14 homers and 14 steals in 436 plate appearances this year, including a stellar 166 wRC+ against southpaws. He’s an average to slightly below-average defender in right and is owed approximately $4.8M through the end of the season. Pence is a rock solid player who got overrated earlier in his career because he was the proverbial “best player on a bad team,” but he would be a huge upgrade to the current Yankees. He won’t come cheap, but even with Soriano aboard, New York should make a run at him. There are plenty of ways to get someone like this into the lineup.